A sweet little beaded brooch – just for fun. Just like many of my projects – this one began in an airport. Am I the only traveller that doesn’t mind sitting and waiting in an airport? It’s one of the few times I’m alone with no demands on my time. Perfect for a little bead project. 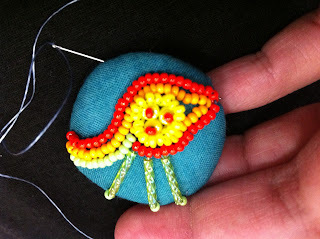 Beaded fabric projects are beautifully portable. 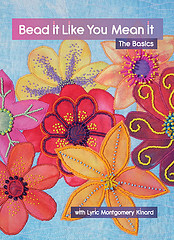 Techniques for beading on fabric can be learned on my DVD workshop, Bead It Like You Mean It. Great colors and design, Lyric! So nice to be able to do something creative at the airport.